We talk about WiFi scanning all the time but is it truly something that people are doing? Several manufactures have now released the WiFi capable scanners and each one has something to offer be it speed, duplex scanning, Android, iPad or iPhone scanning. Plus each one may or may not scan to MAC OS connected via the USB Cable. Most companies are interested in MAC scanners based on our sales throughout the year. Not really sure if they are using the WiFi option. With that said Canon has introduced the Canon DR-C225W WiFi Scanner. It has fast duplex speeds of 50 images per minute. 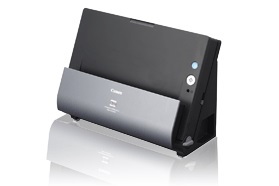 As you can see the Canon C225W scanner is a small desktop scanner with the ability to scan hard cards or long documents up to 118 inches in length. The Canon C225W also supports up to 11X17 documents with the Patented “Folio Mode” by Canon. Canon also posted the following and we believe the NEW Canon C225W will be a great scanner for the small office or someone who is looking for department scanning. Ideal for your customers in legal, healthcare, financial, real estate, and more, the imageFORMULA DR-C225W scanner will help increase efficiency in small corporate workgroups or small office environments. Using the free downloadable Canon CaptureOnTouch Mobile app, the scanner’s built-in wireless capability will allow your customers to scan across various devices including mobile iOS devices such as iPads® or iPhones® and Android devices to help reduce cable clutter and broaden connectivity options. The DR-C225W scanner also simplifies the scanning process with the bundled CaptureOnTouch software, allowing customers to pre-configure routine jobs for one-touch scanning and be able to scan directly to third-party cloud applications. With a unique upright design, the DR-C225W scanner can conserve desk space and also assist your customers in converting their never-ending piles of paper documents into editable and manageable electronic files. For best price on the Canon DR-C225W or multi unit pricing contact us here at Scanner One, Inc.